There have been a number of New York State OA First Flaps recently ended on eBay. Here is one for a Chi Sigma Lodge #546 First flap. This one was listed several times starting in the mid $ 900’s which was where the previous one sold around a year ago. The bidding started at $ 840.00 and the seller dropped the BIN price to $ 800.00 where it was promptly snapped up by the discerning buyer. An auction recently ended for an old tough issue from New York State. Hanigus Lodge #47 merged with Chappegat Lodge #15 to form Mide Lodge #15 in 1957. They never issued a flap, so even their odd shapes command a premium price. I had posted about one that ended last summer, but this one did even better. 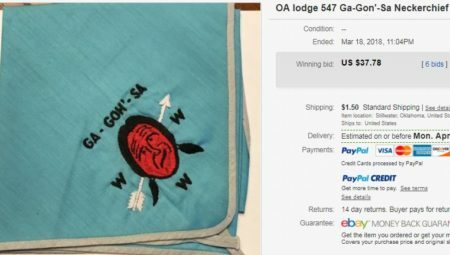 An item recently ended on eBay, the Shu Shu Gah Lodge #24 Neckerchief the N9. Unlike many of the Shu Shu Gah Lodge neckerchiefs which typically sell in the $20-25 range, this is one of the more seldom seen issues. This is one of several which fall into that category. While there was only a couple of bids, the two bidder knew the value of this item, and the winner paid nearly $ 190.00 minimum bid amount. My neckerchief needs from Shu-Shu-Gah include the N1b, N2, N3, N4a, N4b, & N7. Anyone have them for trade or sale? With the TOR in VErona this weekend, I’m looking at items that have recently sold from the local lodges. One of those items of interest to NY Collectors recently ended on eBay, a Gonlix Lodge #34 Arrowhead the A1b. 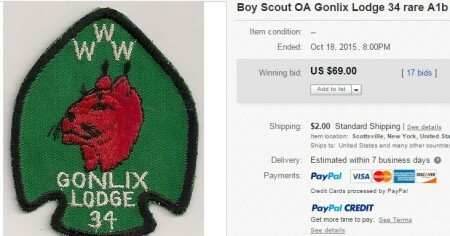 There were 10 unique bidders who made 17 bids on this item. Five of them hanging in it to over $ 50.00 before the final hammer came down at $ 69.00. It started at a modest $ 4.99 opening bid. Did it find its true value? I had previously written about the Tahgajute Lodge #247 J3 Ceremonial Team Patch, one of the toughest items from Tahgajute Lodge #247. One recently showed up on eBay. 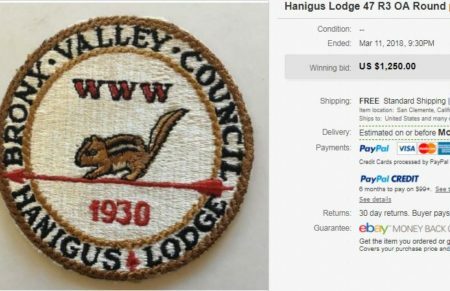 this one was probably hurt since it does not contain the lodge name or number, but their were still for unique bidders on this on driving the price up to over $ 56.00.